Spider veins are capillary veins which are easily visible through the skin, and generally appear as tiny webs of red, blue, or purple lines. Spider veins can become quite noticeable when they accumulate in sufficient number. Because of their small size and superficial location, spider veins rarely account for any symptoms in the legs. Although they are rarely a medical issue, many of our patients seek to eliminate their spider veins to enhance the aesthetic appearance of their legs. 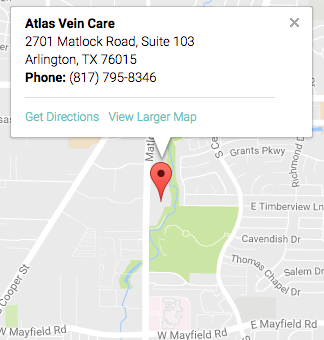 Atlas Vein Care is known for quick and safe spider vein removal in Arlington, TX. Dr. Thomas E. Eidson is a double board-certified physician holding board certification as both a Family Medicine physician and as a Venous Disease Specialist (Phlebologist), his unique expertise makes him a spider vein treatment expert. Almost all insurance companies consider spider veins to be a purely cosmetic issue. Which means that treatments are NOT covered under insurance. Spider veins are rarely a serious health problem. However, sometimes patients suffering from vein problems in the legs will have several symptoms, spider veins being one of them. Insurance companies will cover medical treatments for vein problems in the legs, but unfortunately will not cover spider veins. 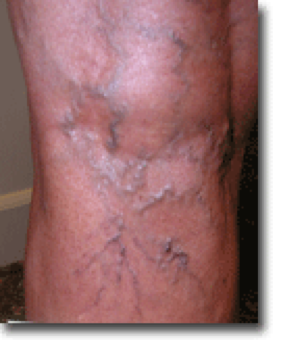 Very rarely spider veins will become so large and fragile that they will bleed. This usually occurs in patients with very dense spider veins around the ankles. The ankles almost appear to be purple because of the density of the veins. Spider veins can develop for a number of reasons, but the primary causes appear to be heredity and hormonal shifts. They can occur in both men and women of any age, but are typically not a serious health problem. Age and lifestyle can also play a role in the development of spider veins. Since the predisposition to spider veins is mainly genetic and also linked with hormonal changes and environmental elements, there is really no way to prevent spider veins from developing. You can try wearing graduated compression socks (20-30mmHg) to help with circulation in your legs. This may or may not help with your spider veins, but it will improve the circulation in your legs. At Atlas Vein Care, we evaluate and treat spider veins. We find that sclerotherapy, which involves introducing special medications into the veins using a tiny needle, offers the best results with the least discomfort. Over the years, there has been an evolution in the techniques and medications used for treating these tiny vessels. While saline solution was used many years ago, it was uncomfortable for patients and carried unnecessary risks. Newer FDA approved agents, such as Polidocanol (Asclera), are much safer, much less painful, and give better clinical results. Spider veins are tiny, but slightly enlarged unsightly dermal capillaries. Sclerotherapy is an in-office treatment used to eliminate "spider veins" - these tiny purple and red veins on the surface of the skin. Using a micro-needle, a special medication is injected into the spider veins, causing them to close and ultimately fade and disappear. The resolution of these tiny veins is not immediate, as several weeks are required for the veins to undergo significant resolution. There is little to no discomfort with spider vein sclerotherapy, which is performed at our office and no downtime is required following the procedure. While treatment of spider veins is very effective at treating what we see, sclerotherapy cannot prevent new spider veins from developing. We believe that heredity and the cyclical swings of female hormones play a role in the development of spider veins. If new ones develop over time, they will always be treatable. Here is a video of an actual procedure of Sclerotherapy. “After an injury 36 years ago, I developed spider veins on both thighs that had grown to be about 3 inches in diameter. I was nervous about getting them treated but, surprisingly, I experienced almost no discomfort at all. And even more amazing was that I saw about 80% improvement immediately and another 10% improvement over the next two weeks. I should have done this a long time ago!” -B.E. © 2019 Atlas Vein Care. All Rights Reserved.